9:10 - Economist Morten Jerven explains why the West misunderstands economic growth in Africa. Morten's latest book is Africa: Why Economists Get it Wrong from Zed Books. 10:05 - Live from Sao Paulo, Brian Mier reports on anti-austerity marches across Brazil. Brian wrote the Brasil Wire article Against Austerity: World Habitat Day. 10:35 - Our Man in London, David Skalinder translates Jeremy Corbyn to American ears. According to Dave, "UK politics has just become properly interesting for the first time in maybe fifteen years." 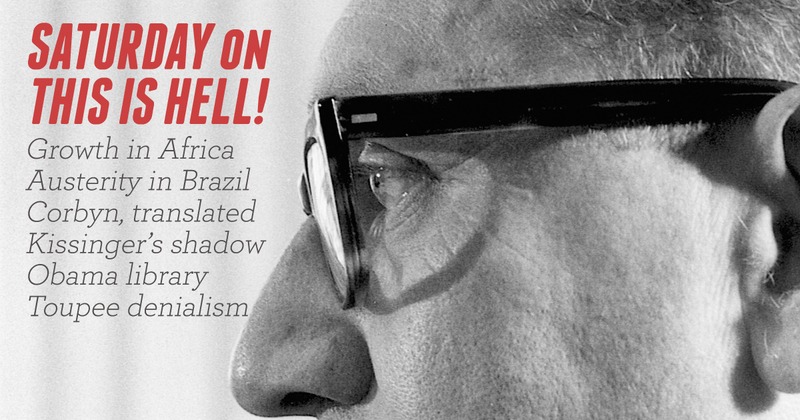 11:05 - Historian Greg Grandin explores Henry Kissinger's imperial architecture. Greg is author of the new book Kissinger's Shadow: The Long Reach of America's Most Controversial Statesman from Macmillan. 12:05 - Writer Rick Perlstein checks out of Obama Presidential Library politics. Rick wrote the There Goes the Neighborhood:The Obama Library Lands on Chicago for The Baffler. 12:45 - Jeff Dorchen admits that we are in denial about our situation and cannot put a toupee on it. Jeff will be delivering his first Moment of Truth via an actual microphone we just bought him. No more audio fudge!